I had a rough day at work the other day. It was a day filled with running around from one end of the ballpark to the other, making sure things were in place for an event we were doing the next day, making sure our Fill the House for Charity night was going off without a hitch and dealing with the guy who sits next to me (Nate Janoso) who coordinates events for Cleveland Indians Charities. He’s an awesome guy, but he is cursed with rain spoiling every charity event we have. And because rain never spoils my events, I have to constantly take a special chunk out of my day to remind him how funny that is. It is very tiring. With how rough that day was, it only took two minutes to make me remember why I love my job. It all started a week before with a guy named Ken. Ken had given me a call and said he just got back to the states from Afghanistan to his base in Louisiana. His family lives up here in Cleveland and, while they knew he was back in Louisiana, they did not know when he was coming home. We quickly devised a plan which included setting his family (all 32 of them) up with tickets to the August 10 game. Ken’s sister was the only family member who knew what was going on and she coordinated the family part of the plan. Ken flew up to Cleveland and met up with me. I took him down to watch the Indians take BP as well as meet some of the players. We then took him into a room and recorded him giving his family a message to make them think he was still in Louisiana and it would be played during the game. When the time came in the game to roll the tape, we stationed a camera guy right near the seats the family was sitting in and had Ken walk down to the seats to surprise them! 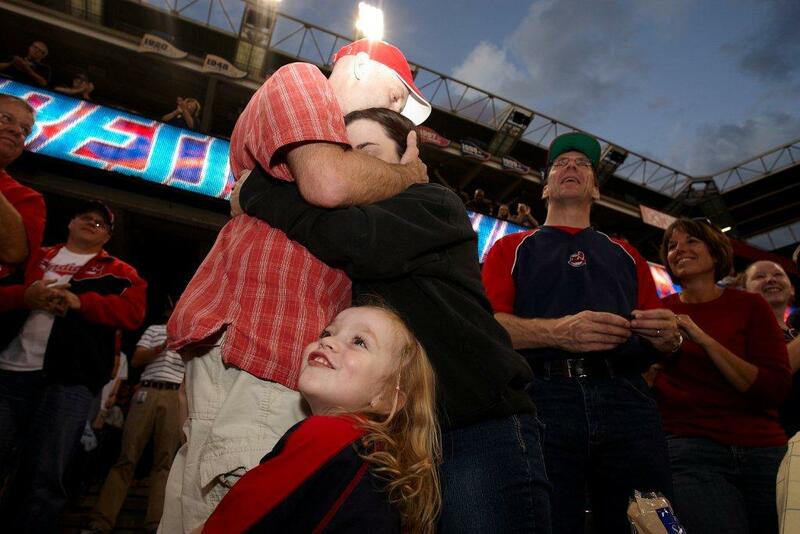 As the entire family watched the message play on the scoreboard, they looked so happy just to see him on the jumbo-tron. Once they then realized he was walking down the aisle they erupted into tears of joy. Ken’s two young daughters ran up to him laughing and smiling. His wife, with tears in her eyes, hugged and kissed him. The crowd of 30,000 gave him a standing ovation and began chanting “USA, USA.” It was a moment that left many fans around him with watering eyes and is a moment I will never forget. Thank you to our scoreboard and camera crew for capturing the moment. Thank you to Ken and all of the servicemen who defend our country on a daily basis. Thank you to Jessica R. for helping keep Ken occupied in between BP and first pitch and thank you Nate Janoso for having it rain on your raffle the night before this all took place so that it would be a nice night for my event! …was a terrible movie. Yes, I’ll admit that I watched it but that doesn’t change the fact of how bad it was. It may be because I am not a shopaholic and don’t understand what they go through so I may have missed half the jokes. I am also not one to confess to anything, but that is a whole different story. 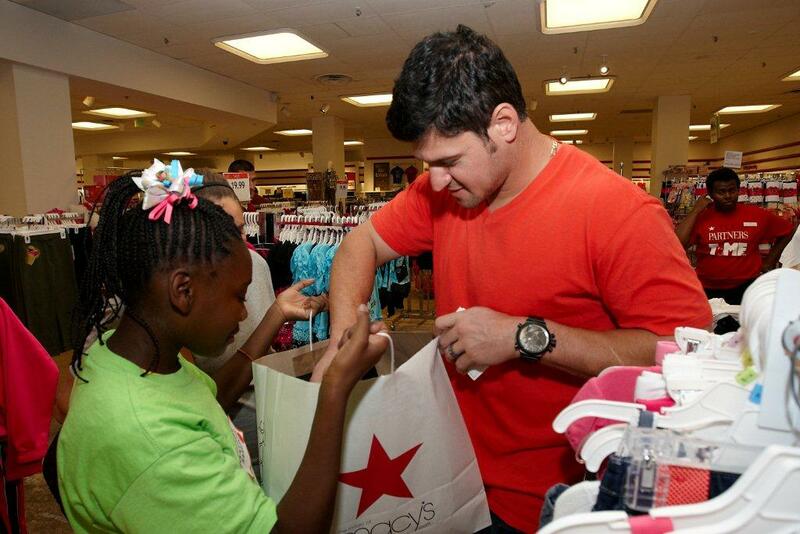 Whether you are a shopper or not, you should enjoy knowing that a couple of Cleveland Indians players decided to get in touch with their inner fashionista and participate in the annual Shop With A Pro event that we put on. Some of the players had a little (okay, a lot) of help from their wives, while the others mixed and matched styles up on their own. Joe Smith, Tony Sipp, Vinnie Pestano flew solo and Justin Masterson, Chad Durbin and Matt LaPorta made it more of a family affair. The event took place at Macy’s over at Great Northern Mall in North Olmsted. 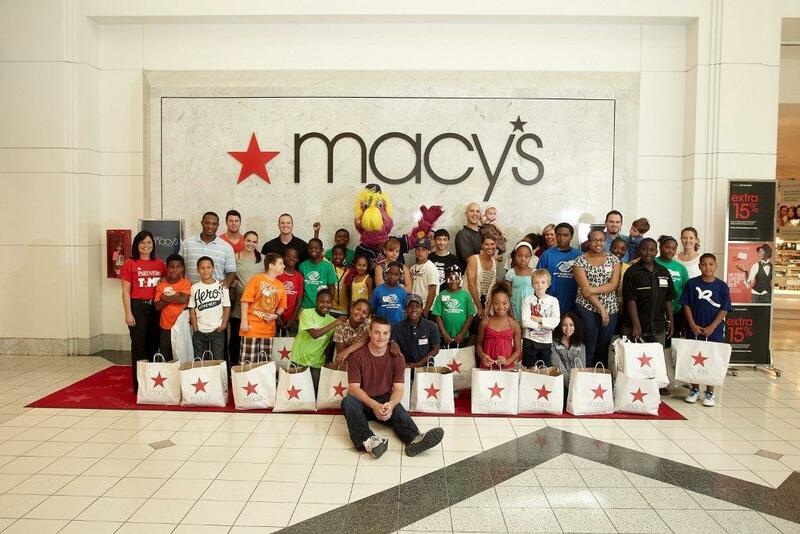 Macy’s provided 30 kids from the Boys and Girls Clubs of Cleveland with $100 gift cards so that they could buy back to school clothes. Levi’s also provided gift bags filled with school supplies for each kid. Thanks to all the players and their wives, Macy’s, and Levi’s for all the help in putting this great event together and making a positive impact on our community!